Background Patients with irritable bowel syndrome (IBS) are often placed on diets guided by food intolerance assays, although these have not been validated. We assessed the effects of individualised diets in patients with IBS guided by a leucocyte activation test. Methods This is a parallel-group, double-blind, randomised controlled trial of 58 adults with IBS seen at an academic health centre in Northeast USA. Peripheral venous blood was analysed using a leucocyte activation test; individual foods were reported to produce positive or negative results. Participants were randomised to a 4-week diet with either individualised guidance to eliminate foods with positive assay results and allow foods with negative assay results (intervention), or with individualised guidance, matched in rigour and complexity, to eliminate foods with negative assay results and allow foods with positive assay results (comparison). The primary outcome was between-group differences in the IBS Global Improvement Scale (GIS). Secondary outcomes included reductions in IBS Symptom Severity Scale (SSS) scores and increases in IBS Adequate Relief (AR) and Quality of Life (QOL) scores. An aptamer-based proteomic analysis was conducted in strong responders. 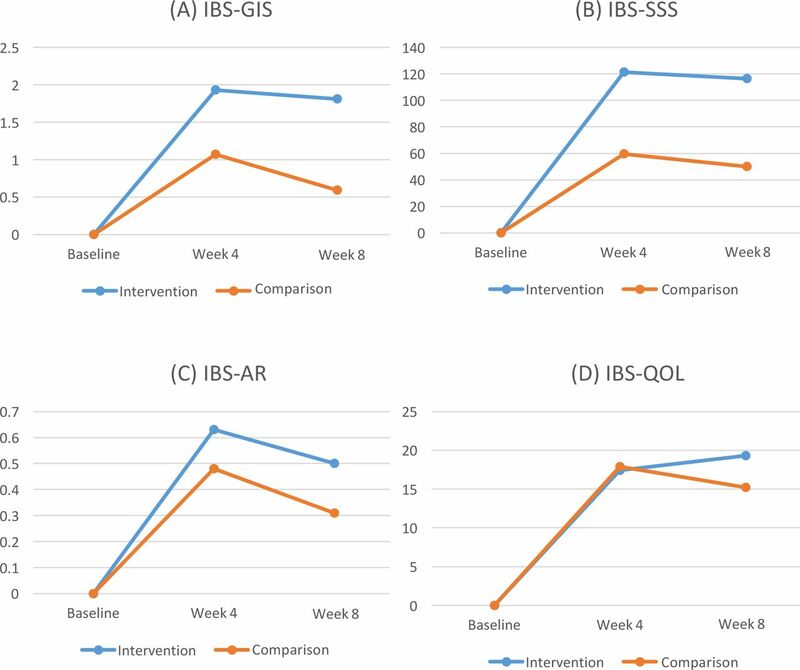 Results The intervention group had significantly greater increases in mean GIS score after 4 weeks (0.86 vs comparison; 95% CI 0.05 to 1.67; p=0.04) and 8 weeks (1.22 vs comparison; 95% CI 0.22 to 2.22; p=0.02). The intervention group also had significantly greater reductions in mean SSS score at 4 weeks (–61.78 vs comparison; 95% CI –4.43 to –119.14; p=0.04) and 8 weeks (–66.42 vs comparison; 95% CI –5.75 to –127.09; p=0.03). There were no significant differences between intervention and comparison groups in mean AR or QOL scores. A reduction in neutrophil elastase concentration was associated with reduced symptoms. Conclusions Elimination diets guided by leucocyte activation tests reduced symptoms. These findings could lead to insights into the pathophysiology of IBS. Over 60% of IBS patients report symptoms related to food, such as symptomatic exacerbations and improvement when avoiding these foods. Previous trials of elimination diets for irritable bowel syndrome (IBS) found varying levels of efficacy, with trials of the low-FODMAP (fermentable oligosaccharides, disaccharides, monosaccharides, and polyols) diet demonstrating promise. No previous randomised trials have been published assessing the efficacy of leucocyte activation testing in IBS. Statistically significant benefits were seen in global improvement and in symptom severity in a 4-week diet guided by leucocyte activation testing compared to a matched sham diet. This study provides novel data suggesting that a leucocyte activation test can be used to develop an individualised diet that can alleviate symptom burden in IBS, distinct from other types of dietary interventions. A broad proteomic screen found a reduction in plasma elastase in strong responders to the intervention diet. This study provides data suggesting that a leucocyte activation test can be used to develop an individualised diet that can alleviate symptom burden in IBS. These dietary changes may be less restrictive than a low-FODMAP diet and may result in better long-term adherence. A number of commercially available blood tests claim to diagnose food intolerance,11 and most remain largely unvalidated.12 Among the more highly used13 are leucocyte activation tests, which are used to guide elimination diet recommendations, although no rigorous studies of leucocyte activation tests are in Medline-indexed journals. These tests are generally considered unproven diagnostic methods for detecting food allergy.14 In a survey of unconventional medical laboratory tests,13 some respondents noted that leucocyte activation testing is anecdotally reported to be of greater clinical value than other unconventional food intolerance assays. Adults 18–75 years of age meeting Rome III criteria for any subtype of IBS15 with active symptoms (SSS ≥150) were enrolled. Concurrent IBS medications (eg, fibre, antispasmodics, antidepressants, loperamide, and so on) and behavioural treatments were allowed if dosing was stable for 30 days prior to enrolment. On enrolment, a single sample of de-identified peripheral venous blood preserved in 3.8 sodium citrate was sent for testing at a commercial laboratory (Alcat Test; Cell Science Systems, Deerfield Beach, Florida, USA) via overnight courier. Leucocytes were separated from whole blood using a density gradient at high-speed centrifugation, and a neutral buffer and autologous plasma were added back to the cells, which were then aliquoted into a round-bottomed test wells or control wells containing 200 test food extracts or neutral buffer, respectively, and then incubated for 15 min, with 100 rpm rotation, at 37°C. Cell counts were performed using the electric sensing zone method (Coulter or impedance method) of particle sizing, distributing each cell into one of 256 size channels, thus creating a size/volume distribution curve, or histogram for each control and each test sample. Differences in morphology curves categorise foods as (1) severe intolerance, (2) moderate intolerance ((1) and (2) denoted as positive in this study), (3) mild intolerance (denoted as mild), or (4) acceptable foods/no reaction ((4) denoted as negative in this study). 1. Intervention: individualised diet consistent with test results. Participants were instructed to avoid positive foods for the diet period (4 weeks). Participants were allowed to consume mild foods every fourth day, and negative foods ad libitum, consistent with usual clinical practice. Dietary instruction was delivered at baseline (in person; 30–45 min) by a blinded registered dietitian, and after 2 weeks (telephone; 15 min). After 4 weeks, participants were instructed to consume an ad libitum diet. 2. Comparison: individualised sham diet systematically inconsistent with test results. Participants were assessed at baseline (the day prior to starting the diet), 4 weeks (the final day of the diet), and at 8 weeks postbaseline. Based on results from Kaptchuk and Lembo assessing responses to placebo interventions in IBS,19 an analytic sample of 46 participants was calculated with 80% power to detect a between-group difference of 1.1 points (SD=1.3) on the GIS (two-sided; α=0.05). Accounting for up to 25% attrition, 29 participants per arm were recruited (total n=58). Analyses were conducted using Stata V.14.1. Individual changes between baseline and week 4 were computed for each outcome and tested for whether the mean change observed in the intervention and comparison groups differed significantly (α=0.05) using independent t-tests. Distributions of change across time were tested for equality between the intervention and comparison groups using Wilcoxon rank-sum tests. The t-tests have more statistical power, while the Wilcoxon rank-sum tests are more robust to non-normality of the underlying distributions. Effect sizes (Cohen’s D) were calculated as the mean difference in changes across time between groups divided by the pooled SD of changes across time. The same analyses were performed for changes between baseline and week 8. Analyses followed the intention-to-treat principle. Proteomic data were analysed by paired t-tests (α=0.05). To account for multiple comparisons, a Benjamini-Hochberg correction with a false detection rate at 0.3 and significance threshold at 0.05 was applied. Of 126 volunteers screened, 68 were not eligible or declined to participate. Fifty-eight participants were randomised between July 2014 and November 2015. One participant, randomised to intervention, declined to participate as new employment resulted in a lack of time to participate. Two other participants (randomised to intervention) left due to participant burden (one prior to week 4 and one between weeks 4 and 8). All 29 participants in the comparison group completed the study. Thus, 56 participants (97%) remained for the week 4 analysis and 55 participants (95%) remained for the week 8 analysis. The final follow-up visit (8 weeks) occurred in January 2016. The trial ended once the predetermined sample size (58) was achieved. There were no missing data (see figure 1). 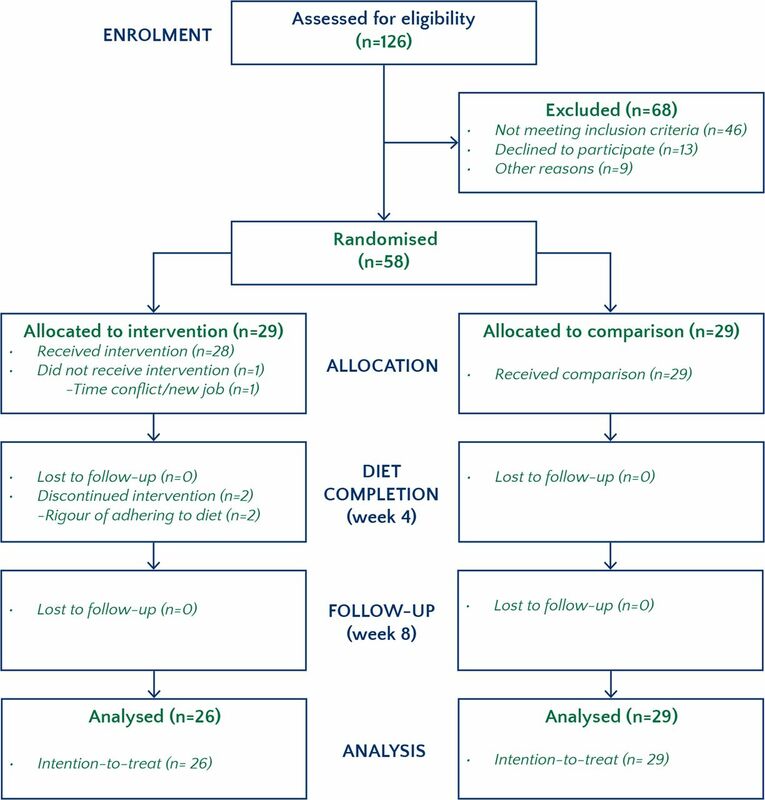 The intervention diet resulted in a statistically significant change over time in GIS between the intervention (n=27) and comparison (n=29) diet at 4 weeks with a mean between-group difference equal to 0.86 (p=0.04, 95% CI 0.05 to 1.67). The significant improvement in the GIS in the intervention group persisted at 8 weeks with the mean between-group difference equal to 1.22 (p=0.02, 95% CI 0.22 to 2.22) (see table 3 and figure 2). Change from baseline in global improvement, symptom severity, adequate relief, and quality of life. IBS-GIS indicates the Irritable Bowel Syndrome Global Improvement Scale; IBS-SSS, Irritable Bowel Syndrome Symptom Severity Scale; IBS-AR, Irritable Bowel Syndrome Adequate Relief; and IBS-QOL, Irritable Bowel Syndrome Quality of Life Questionnaire. Values are expressed as mean change. Positive scores denote improvement. The intervention group demonstrated significantly larger between-group improvement than the comparison group in the (A) GIS at 4 weeks (1.93 vs 1.07; ES 0.55, p=0.04; n=56—primary endpoint) and 8 weeks postbaseline (1.81 vs 0.59; ES 0.63, p=0.02; n=55), and (B) SSS at 4 weeks (121.4 vs 59.6; ES 0.56, p=0.04) and 8 weeks (116.4 vs 50.0; Effect Size (Cohen's D) (ES) 0.57, p=0.03) postbaseline. No significant between-group differences were seen in the (C) AR and (D) QOL scales. Relative to baseline, all outcomes improved in both groups at 4 weeks and 8 weeks. Both the intervention and comparison groups demonstrated significant improvements from baseline in SSS, with the intervention group experiencing significantly larger improvements. The mean between-group difference in change since baseline at 4 weeks was –61.78 (p=0.04, 95% CI –4.43 to –119.14), and the mean between-group difference in change since baseline at 8 weeks was –66.42 (p=0.03, 95% CI –5.75 to –127.09) (see table 3 and figure 2). This finding is of interest as elastase is widely distributed in innate immune cells, including in neutrophils and mast cells. Mast cells are of particular interest as they have been shown to be increased in close approximation to nerves in the colonic mucosa.49 50 Mast cell mediators such as tryptase and histamine are increased in the colon of patients with IBS.49 Elastase can cause tissue damage and also disrupt tight junctions, which may increase intestinal permeability.51 The validity of the clinical results is not dependent on the proteomic data, which may however provide mechanistic insights. Future studies can investigate mechanistic factors in greater detail.
. Low-FODMAP Diet for Treatment of Irritable Bowel Syndrome. Gastroenterol Hepatol 2012;8:739–45.
. Unproven techniques in allergy diagnosis. J Investig Allergol Clin Immunol 2005;15:86–90.
. Controlling the False Discovery Rate: A Practical and Powerful Approach to Multiple Testing. Journal of the Royal Statistical Society Series B 1995;57:289–300.
. Statistical power analysis for the behavioral sciences. 2nd ed. Hillsdale, N.J.: L. Erlbaum Associates, 1988.
. Ethics and Regulation of Clinical Research. 2nd ed. New Haven: Yale University Press, 1986.
. Jekel's epidemiology, biostatistics, preventive medicine, and public health. 4th ed. Philadelphia; London: Saunders, 2014.
. J Epidemiol Community Health 2004;58:635–41.
. Neutrophil-mediated epithelial injury during transmigration: role of elastase. Am J Physiol Gastrointest Liver Physiol 2001;281:G705–17.
. The Alcat Test Predicts the Release of DNA and Myeloperoxidase by Innate Immune Peripheral Blood Leukocytes via a PKC Dependent Pathway. J Altern Complement Med 2016:A23. Data sharing statement Individual participant data that underlie the results reported in this article, after de-identification (text, tables, figures and appendices), and/or the study protocol will be shared beginning 9 months and ending 36 months after article publication. Data will be shared with investigators whose proposed use of the data has been approved by an independent review committee ('learned intermediary') identified for these purposes: (1) for individual participant data meta-analysis, and (2) researchers who provide a methodologically sound proposal. Proposals should be directed to ather.ali@yale.edu. To gain access, data requestors will need to sign a data access agreement.